I am an artist who is trained as a theoretical archaeologist. In science I learned to construct a context as closely and exact as possible to create a coherent narrative. As an artist I can deconstruct contexts and mix various sources because they appeal to the narrative I want to create. This gives me a freedom of expression and a different way of analyzing the world around me. My main tool – collage – is fabrication with found footage. Questions arise such as, who do I put in and who is left out? in what kind of a position are the persons placed? are they made ridicilous or heroic? These questions all lead back to the basic notions on who you recognise as a person and how you define that person. The artwork is never innocent. In general I do not limit myself to a specific medium, but collages, digital drawings, collecting, photography and video are my favourite tools. 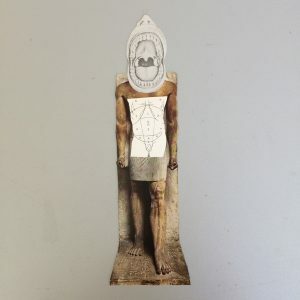 In my work I am keen on the aporetic turn of reclaiming historical traces and turning them into contemporary actions. My work involves projects and events that focus on the connections between and the perceptions of people and their material context. The theme of luminous bodies appeals to me as a queer slightly disabled woman who does not recognize herself in most representations she comes across. Making my own imagery does not necessarily represent my body but makes the viewer wonder about how we construct narratives on the body. 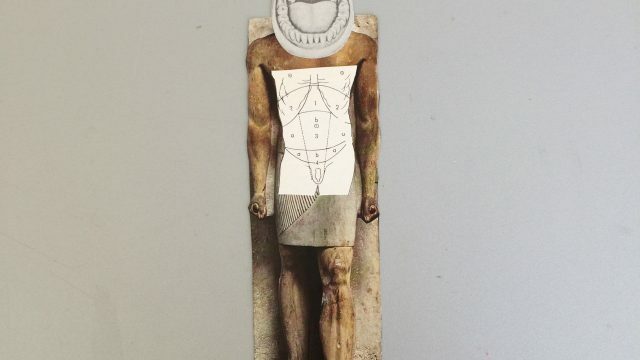 The images try to critically examine popular and scientific projections of the body through the technique of collage. The juxtaposition and mingling of images seems perfect for creating the effect of estrangement and familiarity whereby new meaning is created. At the moment I’m working on two series of collages; one based on human stereotypes, the other on the way the human body is depicted throughout time and the world combining it with scientific drawings. For the Luminous bodies residency I want to integrate these two themes. I want to focus on the female body in its queer forms as I have found in my research that these images are more difficult to find. Strangely enough in the Dutch context which is known for its LGBTQ-rights female imagery in lesbian/queer magazines is very conformist. I did collect some UK magazines but hope to find more material in Toronto with its flourishing queer culture. marjolijn kok is a theoretical archaeologist who turned to art in 2012, after being dissatisfied with the constraints in academia. Occasionally I still work in contemporary archaeology on self-funded projects. For three years I joined the artist’s collective Havenstraat. In 2015 I got my own studio which I now share with my wife line kramer. Together with line kramer we form the artist’s collective the KOKRA FAMILY, which focuses on projects that problematize the concept of family. Since 2016 I work one day a week as the archivist at Witte de With Center for Contemporary Art. I live and work in Rotterdam.